KUWAIT: Coinciding with the national celebrations, the Ministry of Interior began issuing new electronic passports to Kuwaiti citizens yesterday. This was announced during a press conference held yesterday at the General Department for Residency Affairs. Undersecretary for Passport Affairs Maj Gen Sheikh Mazen Al-Jarrah said issuance of the new electronic passports is one of the ministry’s projects to keep pace with technological developments. “This project aims to provide electronic services to citizens and an electronic passport according to international technical standards,” he said. The new passport has been designed according to the highest safety standards after studying offers from major companies. “The final design of the electronic passport includes a smart chip, the same as the one used in other international passports. A local team from the interior ministry is responsible for programming the smart chip that includes the personal data of the holder including fingerprints and electronic signature, in order to protect the passport. The airport is already equipped with readers for this passport, while the ministry is still placing readers at land ports,” added Sheikh Mazen. The electronic signature and fingerprints are required for those older than 12. “Every person has to receive the passport personally, so for instance the husband can’t collect his wife’s passport. Only children under 12 can have their passports collected by their guardians. The validity of the passport is 10 years for those who are over 30 years of age, while it is five years for those under 30. The new passports don’t provide any exemption from visas to some countries as some people believe,” he clarified. Exchanging the old passports with the new electronic ones should be done within a year and a half. “Holders of passports that expired in 2016 are the first ones who will be able to exchange their passports, and these are around 30,000 people. We will then issue the new passports to holders of passports that will expire within six months – around 196,000 passports that will expire this year. Newborn children are included in this category,” Sheikh Mazen explained. 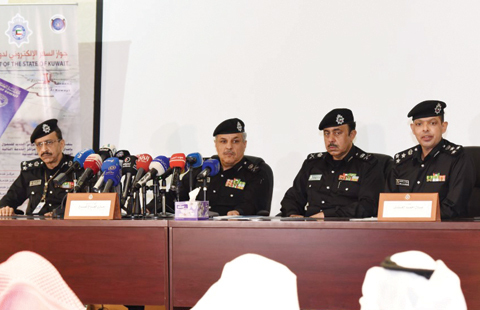 Director of the General Department of Information Systems Maj Gen Ali Al-Muaili explained the ministry’s passport centers are all connected by fiber-optic Internet. “The smart chip includes biometric data of the holder that are transferred from the Information Systems Department to the Passports Department in safe way,” he assured. Brig Yousef Al-Snayin, Director of the General Department for Nationality and Passports, noted that people can book an appointment to receive the new passport through the official website of the Ministry of Information, which will save them time and effort. “We have opened six centers to issue the passports – Shamiya Service Center in the Capital governorate, South Mishref in Hawally governorate, Ishbiliya in Farwaniya governorate, Adan in Mubarak Al-Kabeer governorate, Saad Al-Abdullah in Jahra governorate and Fahd Al-Ahmad in Ahmadi governorate,” he said. Brig Adel Al-Hashash, General Director of the Security Media and Public Relations Department, said elderly people will be given priority. “During the working hours from 8:00 am to 10:00 am, the six centers will only receive elderly and disabled citizens. Also, the new electronic passports will only be issued to Kuwaiti citizens and not bedoons who have article 17 passports. Applying with the original civil ID is the main condition,” he added.